South African President Jacob Zuma gestures as he addresses the nation and press at the government's Union Buildings in Pretoria, South Africa, Feb. 14, 2018. South African President Jacob Zuma has resigned after more than a week of intense pressure from his party to step down. With just an hour left ahead of a Wednesday midnight deadline to resign or face a no-confidence vote, Zuma finally did what he swore he would not do: He quit. Had he not done so, he would have faced what was likely to be an embarrassing, messy no-confidence vote in parliament Thursday, bolstered by the African National Congress, the party that brought him into the presidency in 2009. On Tuesday, the party recalled him, a move they expected to provoke his immediate resignation. When that didn't happen, ANC lawmakers lobbied for a planned no-confidence vote to be moved earlier, to Thursday. Zuma rendered that unnecessary in his 20-minute address to the nation. 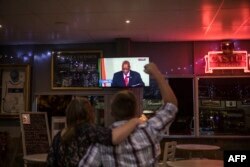 A customer reacts while watching a telecast in a bar in Randburg, Johannesburg, on Feb. 14, 2018, as South African president Jacob Zuma makes a live address to the nation. "I have, therefore, come to the decision to resign as president of the republic with immediate effect," he said. "Even though I disagree with the decision of the leadership of my organization, I have always been a disciplined member of the ANC. As I leave, I will continue to serve the people of South Africa as well as the ANC, the organization I have served all of my life, in it." However, he retained the tone of defiance he had exhibited earlier in the day, when he accused the party of being "unfair." "I do not fear exiting political office," he said. "However, I have only asked my party to articulate my transgressions and the reason for its immediate instruction that I vacate office. This was important in view of the discussions I had with the president of the ANC and the secretary-general of the party that were aimed at uniting our organization, the ANC." The ANC welcomed the resignation and thanked Zuma for his nine years as president. Zuma's final presidential term was set to end in mid-2019. The ANC leadership has argued in the past week, though, that he needed to leave sooner. The party has lost ground in recent elections, largely due to Zuma's growing unpopularity. ANC deputy secretary-general Jessie Duarte praised Zuma's efforts in bringing key developments to the nation still riven by inequality less than three decades after the end of apartheid. "While we acknowledge mistakes that may have been committed, President Zuma leaves a legacy of delivery in many critical areas," she said. 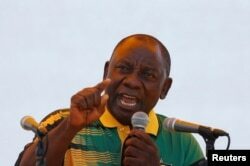 FILE - African National Congress (ANC) President Cyril Ramaphosa addresses supporters during the Congress' 106th anniversary celebrations, in East London, South Africa, Jan. 13, 2018. Duarte also encouraged lawmakers to support Zuma's deputy and successor as leader of the ANC, Cyril Ramaphosa. Parliament has said they hope to swear-in a new president by Friday morning at the latest, and have the new leader deliver the State of the Nation address Friday night. But Zuma also leaves behind bitterness and many questions. Zuma had maintained that the ANC has never told him what he did wrong to deserve a recall from his party or a no-confidence vote. When asked directly after his resignation, Duarte did not specify what Zuma's "mistakes" may have been. But for years, Zuma has been mired in ever deeper, ever wider corruption scandals. For years, members of the party — including Duarte — vociferously defended him in the face of criticism and against eight no-confidence votes in parliament. But those allegations are threatening to be resurrected in court, and make a quiet retirement unlikely for Zuma: He could face numerous corruption investigations, including a pending case that includes 783 charges of corruption.